The thing I love best about Todd Rundgren, chosen from a long and competitive list, is his heart. In “Hello It’s Me,” his best and most popular song, he offers a fresh start to a wronged lover: “It’s important to me that you know you are free,” he bird-croons on the chorus. “I never want to make you change for me.” But the song’s best moment comes when he adds, almost as an afterthought, “I’ll come around every once in a while / or if I ever need a reason to smile / and spend the night if you think I should,” as horns bleat suggestively. 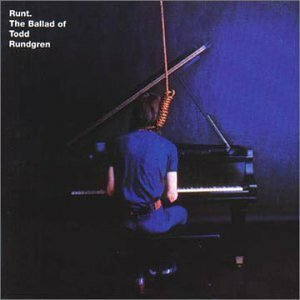 In the soft-rock ’70s, plenty of masculine sincerity could be considered an easy cover for stoned skinny dudes trying to get laid, but Rundgren presents his feelings, amorous and otherwise, with credibility. It’s a through-line to his work that reached another peak in previous ballad “Be Nice To Me,” a soft-spoken song from his second album, Runt: The Ballad of Todd Rundgren. The classic rock canon hasn’t been especially nice to Rundgren: “Hello It’s Me” was only recently added to L.A.’s K-EARTH 101 rotation, he’s never mentioned in the same breadth as Neil and Joni (or Elton and Joel) and perhaps the first time I heard his name on television was during a 30 Rock joke. Mostly importantly, his records are missing from my dad’s otherwise definitive collection, which is why we’re talking about this in 2011. The sophomore Runt is well worth seeking out, a pretty perfect piano-pop record with all the melodic charm of Carole King’s Tapestry and the visionary wanderlust of Neil Young, but it’s “Be Nice To Me” that I’d like to discuss for now. The song’s subject matter is easy enough: “I’m happy just to lay and look / let’s throw out the book,” he sings to a new expectation-free lover, with one caveat. “Be nice to me,” he pleas in a high borderline-whine. So simple, yet how often does one ask for such basic kindness, in life or music? By offering the feeling unadorned and without pretense, Rundgren connects. The gentle, clever way the song eases from verse to chorus doesn’t hurt, nor do his self-sung harmonies, but it’s the feeling which makes the song beautiful.